Twenty graduates from universities and institutions across the island of Ireland have been taking part in a week-long bootcamp during CultureTECH as winners of a University of Ulster led awards initiative. The Creative Buzz Awards are part of the Honeycomb – Creative Works initiative, a £3.58 million skills and business development programme for the digital creative industries. It is led by the University of Ulster and funded by the European Union’s INTERREG IVA Programme, managed by the Special EU Programmes Body. The bootcamp has been designed to provide graduates with unrivalled connections to leading industry figures for networking and mentoring as well offering participants access to potential sources of funding for their creative ideas. Game of Thrones producer, Greg Spence, was a one of a number of speakers on the four-day programme which included workshops on commercial presentations, pitching improvisation and selling techniques. Northern Ireland Screen Chief Executive Richard Williams also attended as a mentor to provide graduates with advice on how to kick-start their career in the creative industries. The graduates were chosen by a panel of industry experts as rising stars of the local creative industries after submitting digital projects ranging from photography, gaming and movies to websites, animation and music. 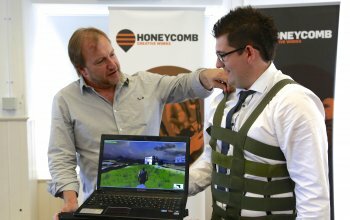 Caption: Pictured Dominic Holmes, a recent graduate from the University of Ulster, showcases his winning project of the Creative Buzz Awards to Game of Thrones producer, Greg Spence, during the Honeycomb Bootcamp@CultureTech. Dominic developed a wearable accessory for gaming which incorporating artificial Intelligence sensory techniques to provide physical feedback during game play.